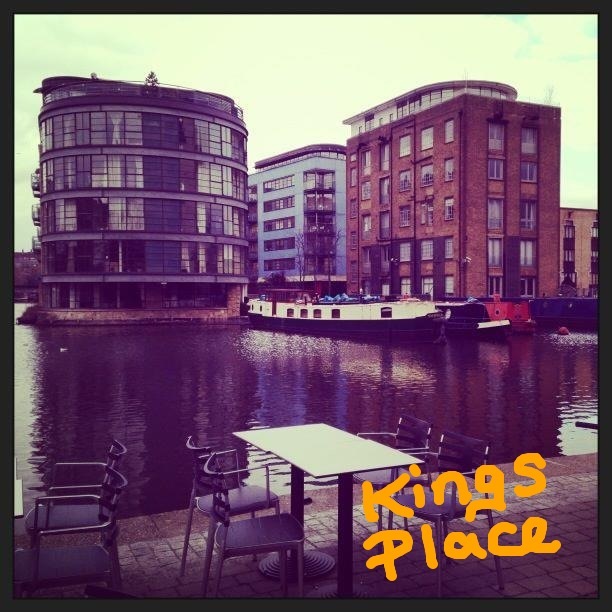 Today I am writing from the next door neighbour of the Guardian building – Kings Place. It is a big space for art, music and events. It backs onto the canal so it is a very peaceful place to write. It startled me when in a break from the quiet, I heard music being played. I looked inside to see an old man who was simply enjoying a coffee and had started jamming on a nearby piano (as you do). He looks so happy. That made me happy. My last post was a time out. I appreciated the step back and perhaps that could be an idea for my future ramblings. I appreciated taking a moment to chat, reflect and tell it how it is. For now, though, it’s back to my 60 postcards in Paris journey. I need to pack the stories in and up the pace a bit because the location has been chosen for my next challenge. Excited is an understatement. In the coming weeks I will be giving you some options for my new task. You are in it with me now! My name is Ivan and I am Luxembourgish; I’ve just returned from Paris last night from a three day visit. First of all: THANK YOU very much for doing it. 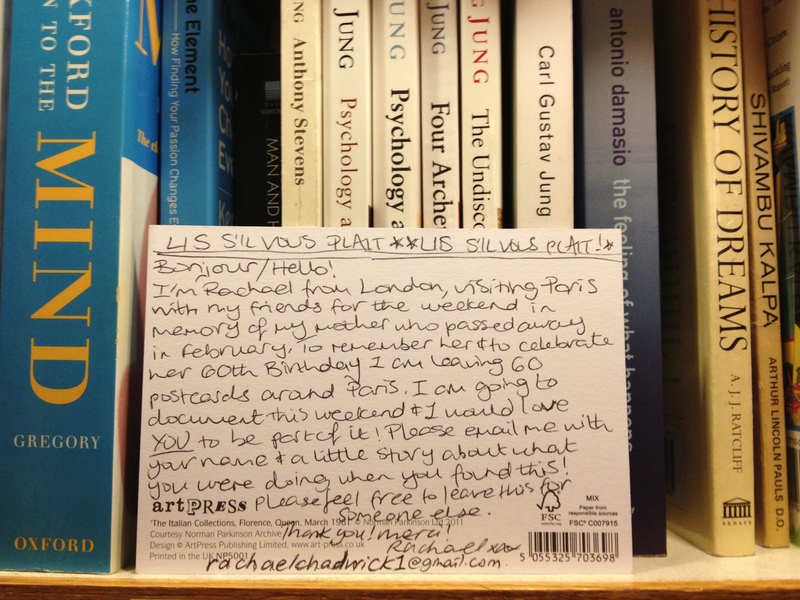 I found your postcard in the Abbey Bookshop, hidden between a bunch of psychology related volumes. These are the kind of things that turns life even more interesting from time to time. I shot a picture of it instantly, didn’t want to miss that moment, or just tried to bring it to an everlasting state. Now, my debt to you is to explain what I was doing there at that moment, well as many other tourists I love that city and i got trapped in that tiny bookshop looking for something, guessing what could be of any interest to somebody living in South-East Spain. What shocked me as time was going by was that I couldn’t find what I was looking for; my theme targets were mainly astro-physics or chinese calligraphy but nothing seemed to appear. Then I saw the postcard sticking a couple of inches out of a shelf. Just a coup de glance among a million. Please keep me informed of your project and don’t hesistate to ask for any other details. Keep on that way, she’ll appreciate it forever. His last comment warmed my heart. I was so pleased that he not only found my card and responded but was so charming about the idea. Messages like this make it all worth it; it’s all part of the magic. I’m going to sign off for now. Getting wrapped up in the view and the calm of my surroundings I’d not even realised my fingers are so cold they may fall off at any moment. Coming soon is a post written from the North East where I will be visiting relatives. Geordie parents you see…. Why aye man, howay the lads, alreet pet (now I just need to work on my accent). Wishing you all a Good Friday.